Here is my entry for today's Age Of Sigmar Golden Demon: Targor from the Shadespire boxed game. 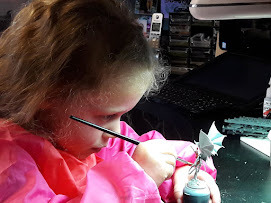 I would like to tell you more about what I had in mind while working on this miniature, things I wanted to focus on... rather than only the paints I used. But obviously if you have any painting-related question, feel free to ask! So, for the last 40k open day, my friend Christian converted and painted a really nice model that he gave to me as a gift after the show. As Age of Sigmar is his favorite universe, I thought I would paint a model for him, choosing a model he made for work! 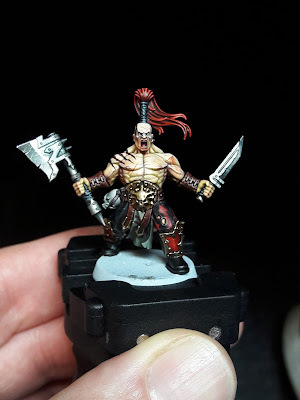 I chose this Bloodreaver as I think his pose really reflects what a Khorne worshiper is like: raging out, super angry and aggressive! 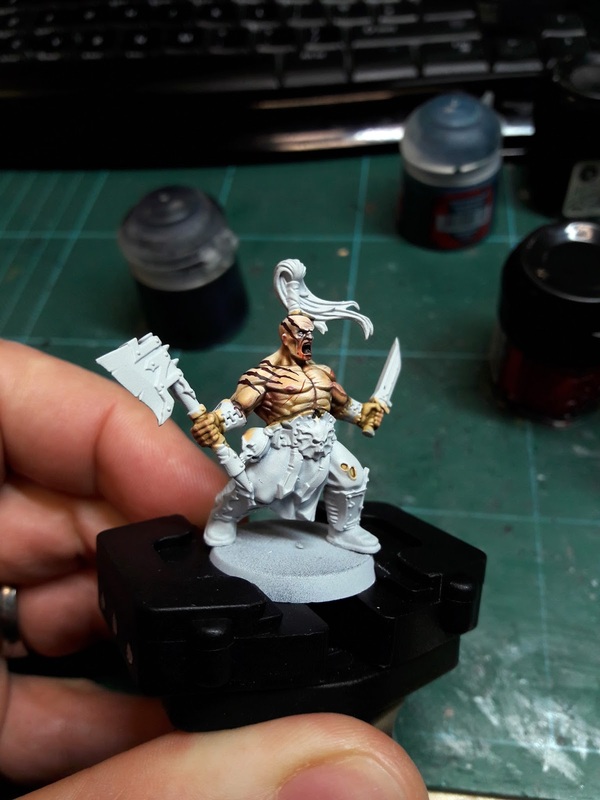 I did minor tweaks to the model, only removing the scarifications for I wanted to paint tatoos instead, and changing the topknot for one I think fits more the model (from the Bloodwarriors kit). I started the painting with the skin as I really wanted to nail the tone and nuances on that part. The base was a lot of fun to make and paint. 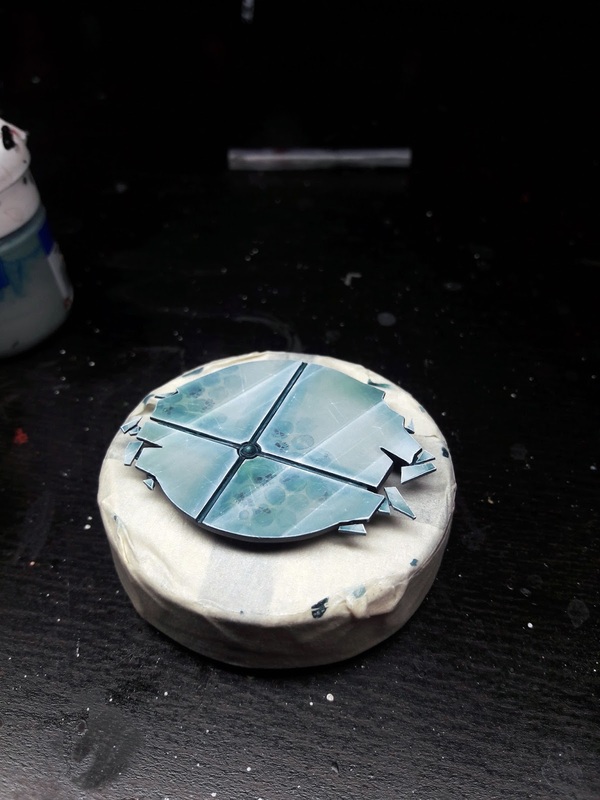 I wanted something very simple and sober, but saying enough about the environement around (the city of Shadespire). I used plastic card for most of it, apart from the jewel which is a green stuff stamp I did on Nagash's staff (thanks Steve for lending me the sprue!). I had this idea in mind of the skulls into the glass, but I was not sure it would look good. I tried to keep it subtle by glazing the basecoat on top of the skulls I free-handed, to get that sense of transparency. I wanted everything on the model to draw the attention to the face and chest. The pose of the model definitely helps with that, but the tatoos and the markings on his leg are there to reinforce this cross-composition. The 3 red areas (topknot and both grieves) are there to frame the model again. I was so keen to making him spit blood! 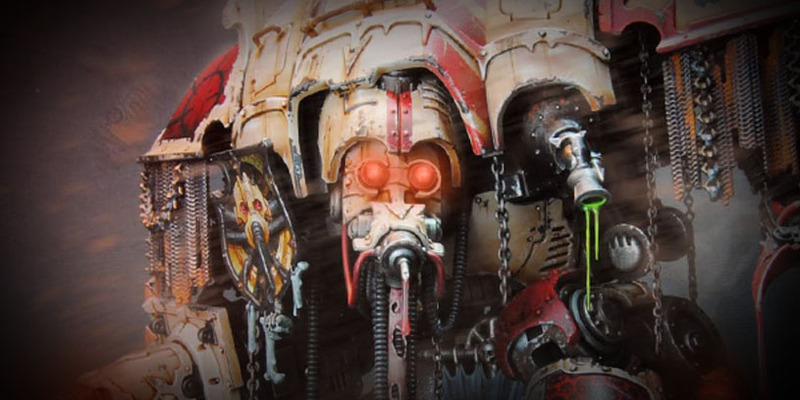 But I did not want him to look like a blood drinker, more splitting blood like he would have got a punch in the face a few seconds ago. To work, the effect had to be subtle. I wanted it to be invisible in front view. I used a dog hair as it is very dark and thin, glued into place before adding a touch of Blood for the Blood God for the drops themselves. 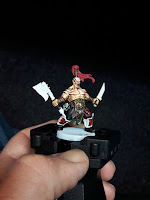 I painted the skin using Elf Flesh, straight on the Corax White undercoat. I applied a general shade of a 50/50 mix of Reikland Fleshshade and Biel Tan Green. Then I used the same mix more locally in the recesses and surfaces facing down. I then applied some nuances in localised areas, using Carroburg Crimson and Druchii Violet. 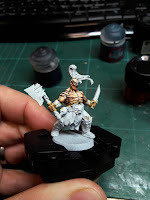 For the highlights, I only added touches of Ceramite White to the Elf Flesh, increasing the amount of white as I pushed the highlights to very small areas. The veins on the biceps are glazed with a 50/50 mix of Fenris Grey and Elf Flesh, and I applied my highlights over them afterward. Painting this model was really fun! I also had a lot of feedback from guys around me, who helped me improve the model. A big thank you to Cagn, Daouide and Larg' of course, but also Christian, Steve, Maxime, Olivier, Alskayer, Joe, Simon, Daz and Ben. You guys rock!!! Wish me luck, he is know in the GD judges' hands! And I thought I would also take some photos of the model Christian gave to me, an amazing Dark Eldar Mandrake conversion, based on a Sylvaneth tree-revenant (such a cool idea). That is not really obvious, but the robes were entirely sculpted by Christian. Good stuff! I love this model, he stands proudly in my cabinet. I hope my Bloodreaver does him justice! EDIT: The competition went really well for me, as I got a Silver trophy in the Staff category! Many thanks to our mighty judges, and congratulations to Pedro Souto and Daz Latham who respectively won bronze and gold! N'hésite pas à demander s'il y a certains trucs que tu n'as pas compris! 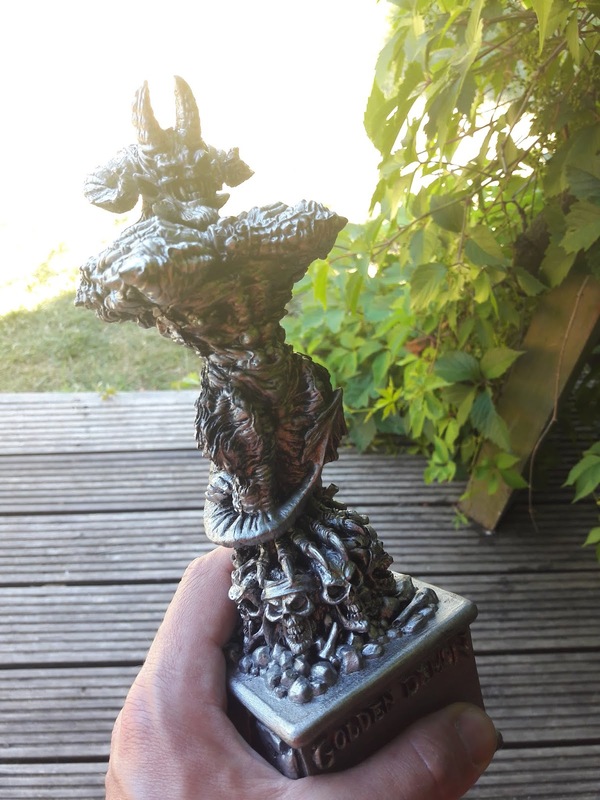 Quant au Golden Demon: ma figurine est pré-sélectionnée, ce qui est déjà super cool! verdict en fin de journée! Trophée d’argent à ce qu’en je vois. Félicitations! Oui en effet, argent ! Un bien beau cadeau ( le sien était chouette dans son genre aussi ). J'aime beaucoup les nuances de vert dans la peau, et les tatouages. La répartition du rouge et la coiffure custom sont top également. Tu ne te ferais pas une petite bande pour yon usage personnel? 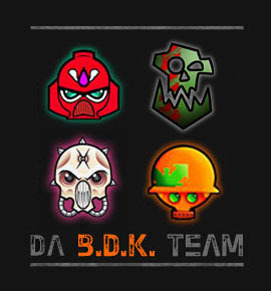 Merci BK! Je suis content que la fig te plaise! C'est super tentant, mais je ne dois pas m'éparpiller! That Mandrake looks incredible, Maxime. 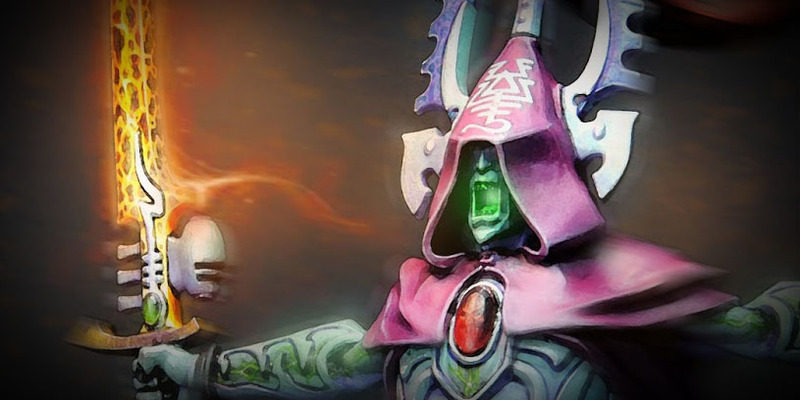 Thanks Fulgrim, but I did not paint this one. My friend Christian painted it for me, that's why I painted him this Bloodreaver. But I agree, it is amazing! Superbe ! 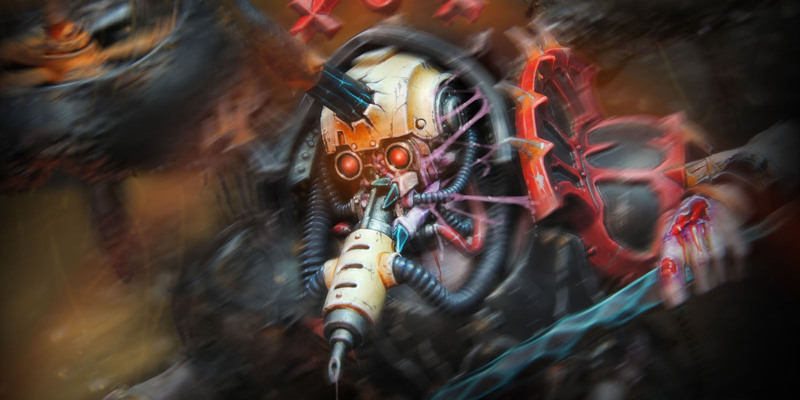 Gros coup de coeur pour la Mandragore, ces créatures sont vraiment les plus classes chez les DE. Et oui les mandragores sont trop classe! L'interprétation de Christian est d'enfer! Magnifique peinture et félicitations pour le trophée ! Je trouve la fig, et la peau surtout, très graphique, vachement intéressant. 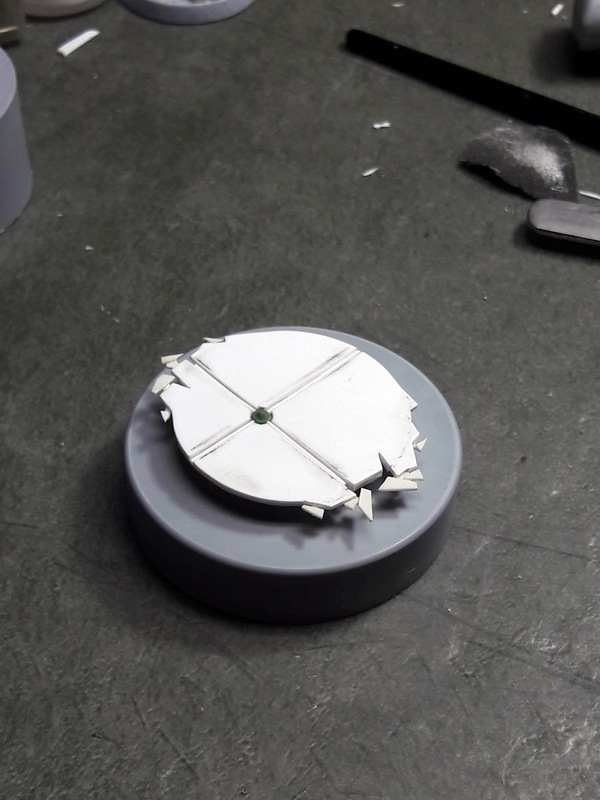 Est-ce que tu aurait des photos de WIP pour la peau ? Au stade ombrages surtout. Je saisis le principe mais justement la luminosité du résultat me surprend vu l'ombrage de base que tu poses. Et non, j'ai très peu de photo de wips en fait car j'ai peint la fig juste avant l'Open Day AoS (qui à l'origine devait se tenir en Février). Dans le rush, je n'avais pas trop pris le temps de faire du WIP malheureusement. Le noir a été éclairci au stegadon scale green, puis en ajoutant du celestra grey à cette même teinte.